South Yorkshire Police have confirmed a total of seven fans were arrested as a result of the trouble which flared at Oakwell on Tuesday night. The Football Association have launched their own investigation after visiting fans wrecked one of the bar areas in the concourse of the North Stand and stole food and money in an incident that marred United's 2-0 win. Eight catering staff were trapped inside a food kiosk and had to barricade themselves in a store room for around 25 minutes as fans broke in. Stewards on the pitch also had food thrown at them during the violence. A South Yorkshire Police statement said: "South Yorkshire Police can confirm a disorder occurred during the first half of the Barnsley versus Manchester United match at Oakwell last night. 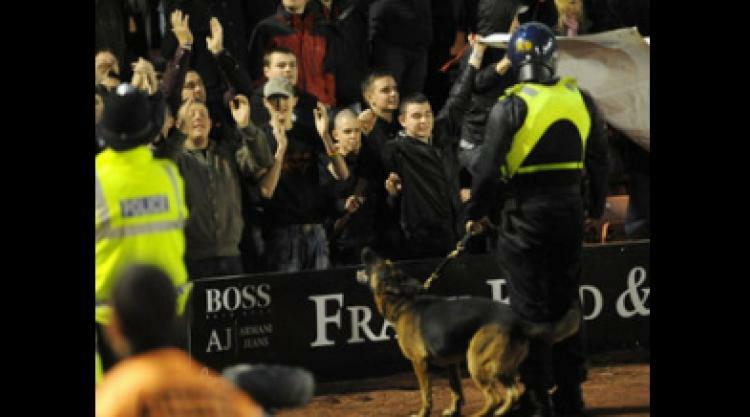 "Police and both football clubs were disappointed by the conduct of a minority of fans. "Police responded quickly and effectively to a spontaneous disorder caused by a small group of people that had gathered near to the central bar on the North Stand. "Officers in protective uniform were deployed to restore order, disperse the crowd and ensure the safety of staff inside the area." Two men aged 22 and 24 were arrested for public order offences, a 26 year-old-man was arrested for theft and a 32-year-old man was arrested for throwing a missile onto a football pitch. All four men are from Manchester. In a separate incident, three Barnsley fans were arrested for running on to the pitch during play. The FA are awaiting the report from their crowd control advisor present at the game, as well as from referee Chris Foy. The FA are also liaising with both clubs and South Yorkshire Police to gather evidence relating to events at the ground. An FA spokesperson said: "There is no place for anti-social or violent behaviour in our game. "Any culprit found to be involved in these disturbances and identified as such by either the police or clubs should be subject to a lengthy ban from attending football matches." Barnsley immediately launched their own investigation into the disturbances. A club statement read: "The club are working closely with South Yorkshire Police and any persons found to be involved can expect a lifetime ban from Oakwell Stadium. "Barnsley Football Club will also press for the full use of the law against any persons identified in the events." A Barnsley spokesman added: "Scene of crime officers are down here now going through the North Stand and we're proceeding with our own investigation as well. "It's a hell of a mess down there. Doors have been kicked in, tills have been damaged and there's food and drink everywhere. It looks like a swamp in one of the bars."